This hike had been on my list for a couple of years. Knob Lock Mountain (3192') lies in the northern end of the Giant Mountain Wilderness and has an open rock summit with 360 degree views. The mountain is also known as Elizabethtown # 1 on the topo maps. There is no trail leading to it, but it is a relatively short bushwhack of only a couple miles each way. I knew I'd have a late start today, and this hike fit the bill. There is still almost no snow in the northern Adirondacks, so bushwhack hikes are still quite easy if you pick your routes carefully. The best way to access Knob Lock is from the eastern ridge. It offers lots of open rock and the dense treed areas are small. I started by parking at the northern end of the Giant Mountain trail on Route 9N. This trail also leads to Owl's Head lookout, which offers great views. 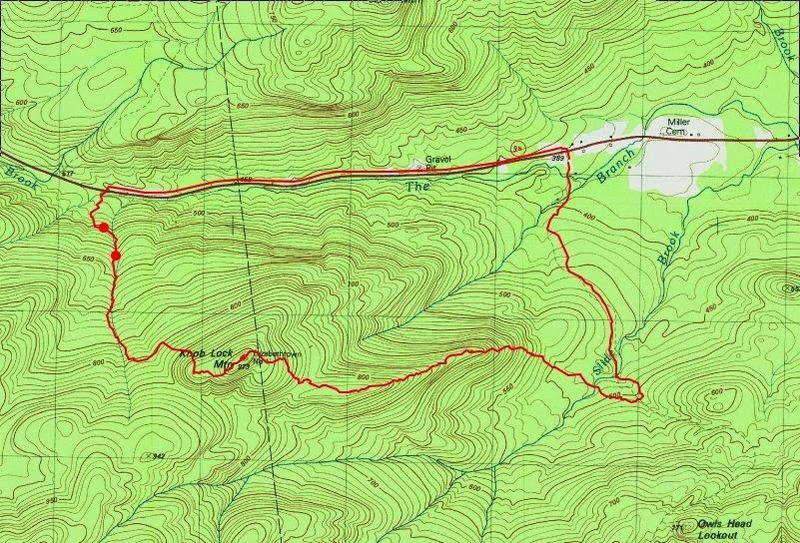 I wanted to follow the Giant Trail south 1 mile and then turn west just before Slide Brook to begin climbing the eastern ridge. I had views east towards Elizabethtown as soon as I had climbed a short way on the ridge. I could also see the Owl Head Lookout. The walking was easy. The stretches of open rock were covered with soft snow and almost no ice. When I left the east ridge, the terrain drops slightly into a col with a huge glacial erratic. I then found the going to be tougher. There were some thick patches of spruce that I waded through. I was now working my way towards the NE ridge. This approach was gentler and more open than heading straight west. The bushwhacking was moderate the remainder of the way to the summit. My course was obvious and I plodded along. My hound dog Rev was having no problem with any of this. Another look and Knob Lock. Note the NE ridge has some open areas. The summit of Knob Lock! Looking North to Hurricane Mountain. Route 9N down below. The summit truly does have a 360 degree view and it's quite fantastic. I took pictures in all directions and stopped to have some food. I didn't linger too long since it was late and the snow was starting. I decided to continue westward. I knew there was a nice waterfall in the drainage to the west/nw and I wanted to locate it. It would probably be frozen, but once I located it, I could come back in the summer. I clawed my way through some pretty thick sections in making my way to the drainage. I finally got there and then just followed the drainage downhill as it led north. The waterfall was indeed frozen but it looks like this area would really be worth checking out during the spring or summer. From the waterfall, it was just 15 minutes back to Route 9N. The drainage intersects the road just east of the Hurricane Mountain trailhead. Back at the road, I just walked the road 2 miles east back to the car. The entire loop took 5 hours, including my stops. I'll be sure to head back in the opposite direction to see the waterfall in summer. Thanks. Yes, I'm glad I finally got there. It's a great spot. I want to see that waterfall also. It looks like it is pretty awesome. Thanks for reading.